The advanced three-panel design and low breathing resistance filter technology applied to the 3M Aura 9300+ Series provides optimum comfort and easy communication, thus ensuring improved wearer acceptance even during long working hours. Being foldable they offer you more convenience than traditional cup shaped respirators. Its features include an embossed and sculpted top panel for improved compatibility with reduced fogging of eyewear and an innovative chin tab to improve the ease of fitting. Low Breathing Resistance Filter Technology gives effective filtration with low breathing resistance for consistent high quality performance. Fold-Flat, easy to store, proprietary 3-panel design accommodates facial movement for wearer comfort. 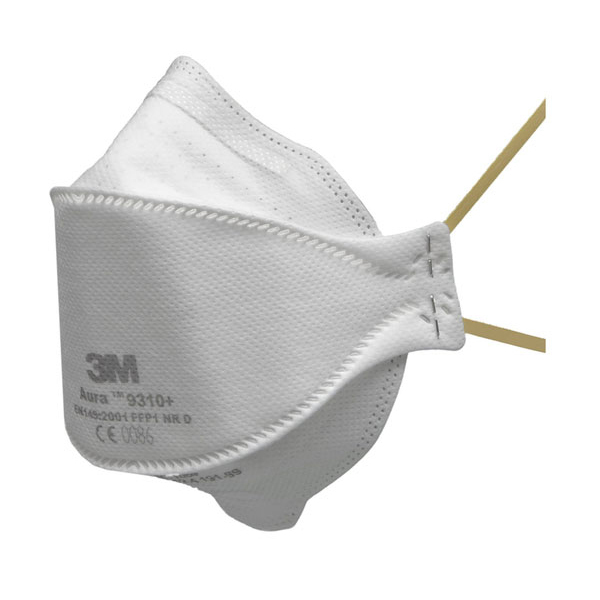 Individual hygienic packaging helps protect the respirator from contamination before use. Smooth inner cover-web and large soft nose foam for greater comfort against the skin. Even-tensioned straps relieve pressure for a comfortable and secure fit. Yellow colour coded straps denoting FFP1 protection level.